Vintage, Gold, Circle Scarf Clip – And How to Use it! The exchange of love tokens is part of various rituals between two people. Small gifts help to cement the bond of friendship and all kinds of love. We seem pre-programmed to share with those we love. A child sharing with a parent is a small act of love. As we age gift giving is no longer a risk free venture, nor is it a guarantee of friendship. Give a small child a cookie and you might receive half of a soggy cookie in return… or perhaps nothing at all. It is these simple token exchanges that educate the child, they teach the child that giving is part of receiving. Encouraged in home and at school, the practice of giving and receiving is a necessary social skill. When Valentine’s Day arrives children bring decorated shoe boxes and small stacks of friendship tokens to share with classmates. A feast of cookies and juice celebrate friendly love. A sweet treat for each participant reinforces the idea of reciprocity and the importance of love tokens. Although it is unknown when the first would-be friend gave a token of affection, we see evidence of the practice throughout history and even in the animal kingdom. Adelie Penguin gives a pebble. From wowanimal.com via pinterest. Love token exchanges take place in nature, especially in the kingdom of birds. 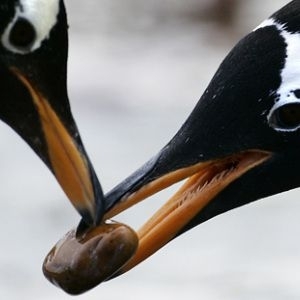 Penguins, for example, give pebbles to one another as a sign of affection, sometimes stealing pebbles from other couple’s nests. Crows bear gifts, and songbirds adorn their nests with bits of colorful string, even when natural materials are available. Birds, like humans, seem to appreciate beauty for beauty’s sake. Indeed, the sharing of objects is evidence of a deeper bond between any two creatures. Love tokens are a cross-species phenomenon. 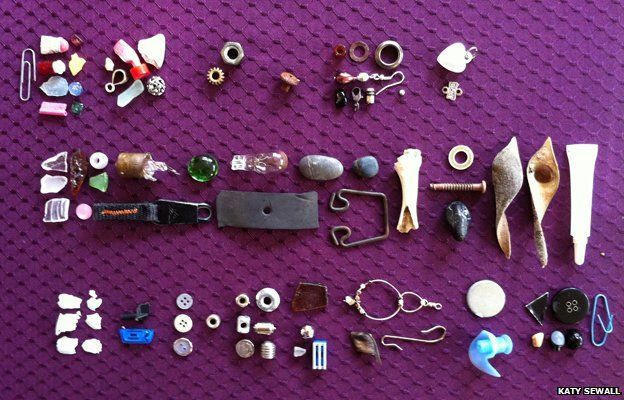 A family in England befriended a murder of crows and now the birds bring them gifts. Tokens from the Crows. Photo by Katy Sewall. Ancient Neanderthal graves contain “carved stone ornaments” that mark the place where loved ones remain. Whether these ornaments are a kind of love token or serve another purpose is unknown, however, the indications we see in the animal kingdom and the social aspects of modern human life suggest the possibility of Neanderthal love tokens. Over the course of human history, each society has a record of acceptable love tokens. In ancient China hair pins, lover’s knots, and halves of things were all considered love tokens. Useful items top this culture’s list of preferred love tokens. In days of old the halves of items identified family members lost to war. Love knots remain as a love token, sometimes worn as a bracelet, tied on a belt, or bag as a reminder of the loved one. He kissed him sweet as sweet could be; his lover’s love’s unbroken. The young man references a pipe as a love token. He is probably talking about a musical pipe and not a smoking implement, although the Greeks enjoyed double entendre, especially in love poetry, which provides other meanings as well. But swear thou think’st I love thee, and no more. Nonetheless, Donne provides a short list of popular love tokens at the turn of the 19th century. Miniatures were quite popular. 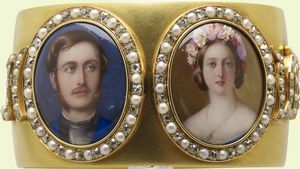 Queen Victoria had numerous miniature paintings of her husband Prince Albert, that she wore as jewelry. After his death she incorporated the idea of these love tokens into a mourning jewelry that featured tiny photographs of Prince Albert under glass. Love tokens have a long history and a variety of applications. They can be a statement and celebration of any kind of love. Whether you are looking for a token of friendship, familial love, or romantic love, we can help you find just the token you are looking for.